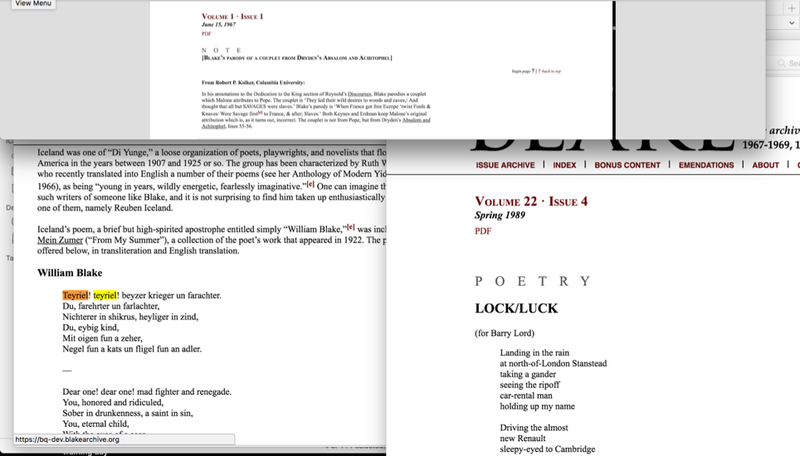 In the six months since my last blog post, I have continued working through Adam McCune’s wordlists to check for misspellings in Blake: An Illustrated Quarterly. I have moved from lowercase to uppercase, from s-z to S-Z. I’m about 60% through the second list, and have been training with Katherine Calvin to work on image markup next, a process which Adam Engel has described in a previous post. My time spent sporadically drifting between issues, my editorial swerve guided by individual words, is coming to an end (at least for now). But as I move away from this task, I would be remiss if I did not mention how much I have learned in the process of wandering through the randomness of single-occurrence words. I’ve also been amazed by the miscellaneous information I’ve come across while skimming articles for context: various historical figures and events of the eighteenth and nineteenth centuries, contemporary poetry inspired by Blake, and the philosophers, critics, artists, scholars, and literary characters that I have read about while dutifully checking to make sure each surname is spelled correctly. All this just by searching for words that, in theory, have a higher probability of being a misspelling because they only occur once in the archive of BIQ. Finally, I’ve learned quite a lot by being wrong. A feeling of complacency can arise while working through the spell check list. A cursory glance at the wordlists and then subsequent delving into the journal or into Google often supports my first assumptions; when I see words like “Titledesigns” or ” Tetragrammation,” I can infer either that the OCR misread or that the original pdf has a typo. And usually either is correct. But sometimes my inferences are incorrect. A case study: I come across a non-word, “Triven,” in the wordlist. Immediately I mentally label the word as a misspelling, though I’m uncertain for what other term. Driven? Trivet? Riven? [I digress for a moment to reflect on what this list shows about me: a culinary-gadget aficionado who enjoyed playing adventure computer games in the 90s. My next thought: can one buy a Blake-inspired trivet? The answer is yes, one can, and options include “The Tyger” and “The Simoniac Pope,” both suitably fire-themed as resting spots for hot dishes.] I search in BIQ and find a book review that includes “Triven” within quotes. “Triven” is no mistake. Then I read the surrounding text of the review out of curiosity, and discover that, according to the reviewer, “Triven” is an example of a wrongheaded interpretation. The book’s author claims it is a mistake for “Driven” in a manuscript draft of “I laid me down upon a bank” in the Songs of Innocence and of Experience. The book reviewer, however, sees this example as representative of the author’s inattention to detail. “Triven” is not a spelling error in this review, but rather is a correct spelling that signifies an error in editorial judgment. 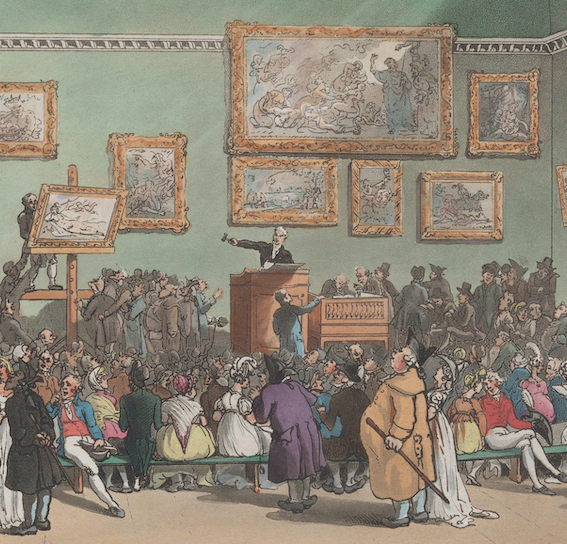 The debate about Blake’s “misspellings” in the process of creating his illuminated books–with the piercing critique that some scholars treat Blake more like an “oblivious telegraph clerk than a poet”–serves as a reminder to carefully consider the original content before making editorial suggestions (68). Warning duly noted, I return to my list, resolved to eschew assumptions and vigilantly attend to context. Pingback: Spelling Lessons | Uncategorized | Aggregated blogs on Romantic Studies - please click through to read full posts.